Cuban coffee have their own distinctive flavor, they are full-bodied and has strong taste comes from the blend of Arabica and Robusta. Cafe Bustelo and Cafe La Llave are two brands of Cuban coffee that is famous among Latin coffee drinkers. If you want to try the famous Cuban espresso, please read our article below. Cafe Bustelo is Cuban coffee brand owned by the infamous J.M. Smucker Company after acquiring Rowland the Cuban-American Coffee Roasters from Souto family in 2011. Cafe Bustelo was founded by a Spanish man named Gregorio Menendez, when he moved to the United States in 1917. The company founded in the Bronx, new York in 1928 and soon after, their coffee are famous among Cuban exiles. Instead preparing the coffee using coffee “sock”, those Cuban exiles preferred using espresso coffee makers. The company continues their journey, being successful throughout 20th Century and was widely known for it’s easy to distinguish yellow and red can. Cafe Bustelo offer different types of coffee products, such as ground coffee, K-Cup Pods, Cold Coffee, and Instant Coffee. In Ground Coffee they have dark roast coffee, espresso coffee and decaf coffee. In the K-Cup Pods they have Colombian and Espresso style. In Cold Coffee category they have milk coffee and chocolate coffee. In instant coffee they have chocolate coffee, milk coffee, regular coffee, decaf coffee, Mexican blend, freeze dried, and decaf freeze dried coffee. If you are interested about Cuban coffee, read our article on Café Bustelo Vs Pilon here. The most popular type among them all is the Dark Roast coffee ground. The Cafe Bustelo Dark Roast taste densely bitter, and heavy rather than full. This coffee is recommended to be served in Cuban-style espresso, by packing it into caffettiere and after brewing, pour the coffee into preheated demitasse cups filled with white sugar and stir them as you pouring the coffee. Cafe La Llave is a brand of Latin espresso ground coffee that is packed in Vernon, CA by F. Gavina and Sons, Inc. Cafe La Llave claims to be one of the country’s best selling espresso brands and famous especially among Latin consumers. The name Llave means Key in Spanish, referring Cuba as the key to the Caribbean with green colors that signify hope in going back to mother country. Cafe La Llave is created with passion and dedication to provide you with authentic cafecito. The coffee is expertly roasted to produce a classic Latin flavor perfected by Latin coffee drinker for Latin coffee drinkers. Cafe La Llave produces consumer products and business products. Their consumer products are the Espresso ground coffee, instant coffee, and Decaf Espresso ground coffee. Their business products are professional coffee machine, espresso coffee whole bean, single pod espresso, and coffee cups. Cafe La Llave characteristics are full-bodied, sweet and balanced with chocolatey aroma of pure 100% dark-roasted espresso coffee. Even though it is full-bodied, the taste of Cafe La Llave is surprisingly smooth and suitable for every moment. Since it is an espresso, Cafe La Llave is finely ground, so you can brew it in your coffee machine, using a stovetop espresso brewer or even on regular coffee maker. Both of Cafe Bustelo and Cafe La Llave is Cuban coffee that is famous among Latin coffee drinkers. Most of Cuban coffee drinkers recommend using Moka Pot when making Cuban espresso. 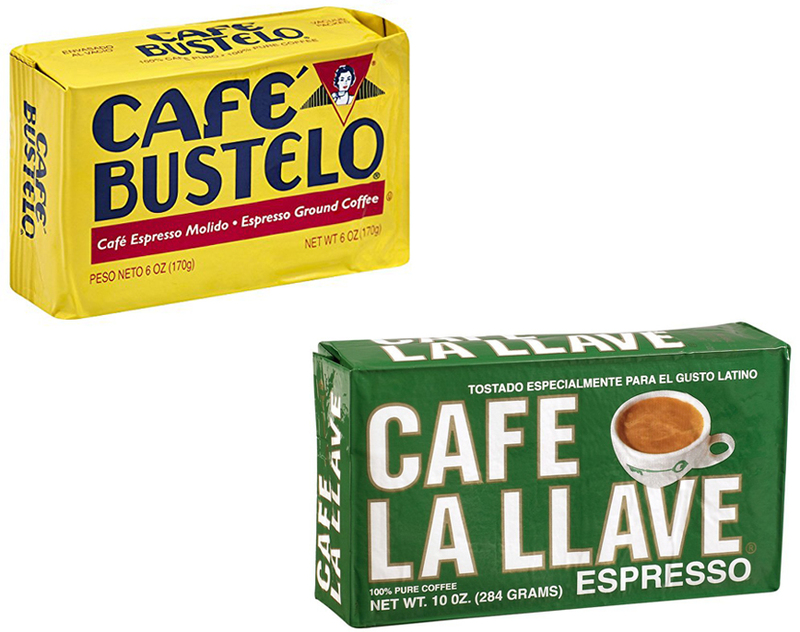 Aside comes from different manufacturers; both of Cafe Bustelo and Cafe La Llave have different characteristics. Bustelo is liked by people who prefer bitter and stronger coffee flavor with some acidic taste. While, Cafe La Llave doesn’t taste as strong as Cafe Bustelo. - No fancy equipment needed — just brew it and enjoy it your way. When choosing between both, you should only follow your personal taste and preference. For those who like strong and bitter coffee, we recommend you the Cafe Bustelo and for you who prefer milder taste, you may like Cafe La Llave better.